In December 2001, CIA paramilitary operative Matt Garrett is mysteriously pulled from Pakistan as he closes in for the kill of Al Qaeda senior leadership and is reassigned to a low-profile mission in the Philippines. 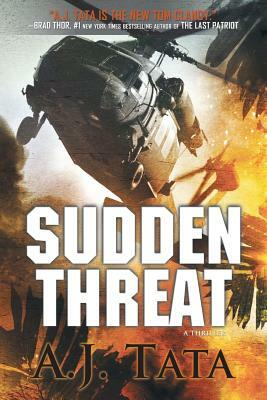 But as he sifts through the wreckage of a downed U.S. C-130 cargo plane in the tangled jungle, he finds a dead U.S. Special Forces paratrooper who is not supposed to be there. Matt is quickly thrown into a contest of wits and resiliency in the uncharted rainforests of Mindanao. Manipulated by the secret plans of a powerful quartet of upper-echelon Washington, D.C. defense politicos, who call themselves the Rolling Stones, Matt and his Army captain brother Zach Garrett establish their bona fides as true patriots on the cutting edge of freedom. They struggle for survival against the rising tide of Islamic extremism and the reemergence of the Empire of the Sun in the ever-expanding Global War on Terror. In the stunning prequel to his award-winning novel Rogue Threat, A. J. Tata creates an uncanny sense of presence on and off the battlefield in Sudden Threat, a novel rife with conspiracy, diplomatic double-talk, betrayal, loyalty, valor and honor.